Monson: Utah is losing Jack Tuttle, its best-ever quarterback recruit. Who’s to blame? Jack Tuttle, the best quarterback recruit Utah has ever landed — no, I did not say the best quarterback — is transferring and we’ve got to find somebody to blame. It is our duty. You don’t just let a four-star guy coming out of California’s quarterback hotbed, a QB who was wanted by Alabama, LSU, Wisconsin, a fistful of teams in the Pac-12, and a bunch of other programs, just walk away without exacting a pound of flesh. He’s the head coach who favors a dual-threat quarterback because his defense-oriented mind tells him those are the toughest guys on the college level to defend. He wants a player who can gain 10 yards whenever it’s necessary without risking a throw that could get picked or a hand-off that could be fumbled. As an extension, maybe it’s the offensive system at Utah, a structure that does everything just mentioned, even though it doesn’t work so well in the NFL. It does in college because school-boy defenders aren’t fast enough to bother a quarterback who can run and pass. That’s why dual threats are so coveted, at least at some schools, where traditional pocket passers have been stashed at the bottom of the depth chart, left to collect dust and hold clipboards and signal in plays from the sideline to the mobile guys on the field. Maybe Whittingham should have thrown the hot-shot recruit a bone, just to keep him and his personal entourage — parents, family members, friends — happy about his prospects for playing in the future. Maybe Whittingham should have ignored the fact that junior Tyler Huntley and redshirt freshman Jason Shelley outperformed Tuttle in fall practices, and elevated him at least to the backup role, just to appease him. On the other hand, if he had done that, all the other players would have known what was going down, and disapproved. That’s the thing about depth charts. The players themselves know who’s playing best. Messing with that could cause a revolt that would be difficult to explain and even more difficult to overcome. Maybe Whitingham could be blamed for ever recruiting Tuttle, because he knew all along that he was a pocket passer, not the kind of quarterback he valued. Or maybe we could blame Tuttle himself, considering he must have known what kind of offense Whittingham preferred, even back when Aaron Roderick was the coordinator and the main recruiting contact with Tuttle. Conversely, Troy Taylor, who replaced A-Rod, came in prior to last season. 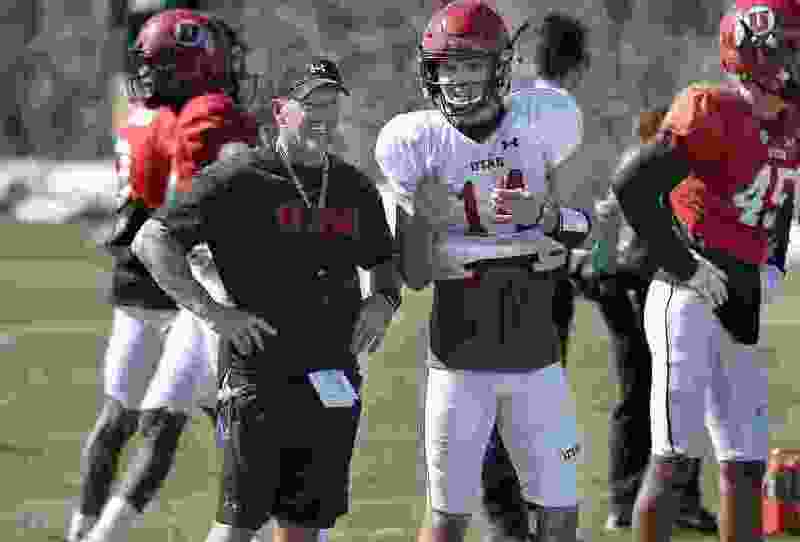 He coached Jake Browning — a drop-back passer — in high school to great success, so perhaps coaches led Tuttle to believe he could thrive at Utah. Maybe we could blame Taylor for last year’s benching of senior Troy Williams, who had won nine games for the Utes the previous season, in favor of Huntley. The then-sophomore would subsequently clog the QB pipeline for seasons to come, including this one, when Tuttle would clearly see that his path to the field is fogged over to the point where he should bolt. Tuttle, even as a teenager, still had the best arm in fall camp. He just didn’t have the other stuff, the experience, the grasp of the offense, the trust of the coaches, the wheels. He arrived early out of high school, in time for spring ball, but that wasn’t enough to redirect the course that was unfolding, a course that a blind man could and should have seen. Had he studied the situation a bit better, he might never have come to Utah. And, now, being in the kind of hurry so many kids are in, so many parents are in for their kids, he wishes he never had. Making matters worse, many believe that Zach Wilson, the freshman quarterback at BYU, would have signed with the Utes had a QB opportunity at the school presented itself. It did not because Whittingham promised Tuttle, if he did come to Utah, he wouldn’t sign any other quarterbacks. Now Wilson is a Cougar. Some say, just trust the coaches, they know what they’re doing and they determined Tuttle to be worth the recruiting promises and then figured him to be a third-string talent for the time being. That’s a contradiction. Others look at the facts, especially in hindsight, and say the whole thing got goofed over, that there are group politics at play, biases that have little to do with individual talent. Which was the case regarding Tuttle at Utah? Either way, people wonder what the effect moving forward will be on Utah’s recruiting, especially as it pertains to quarterbacks. Put it this way: If you were a highly recruited pocket passer, a sky-high talent, if you were John Freaking Elway, would Utah be your preferred destination coming out of high school based on what happened in this case, and based on the program’s recent track record of developing — or not developing — NFL-caliber quarterbacks? Jack Tuttle, Utah’s best quarterback recruit ever, came, anyway. No matter who you choose to blame, the former is a much bigger surprise than the latter.